They don’t call them the “Great” Smokies for nothing – Don't make me turn this van around! 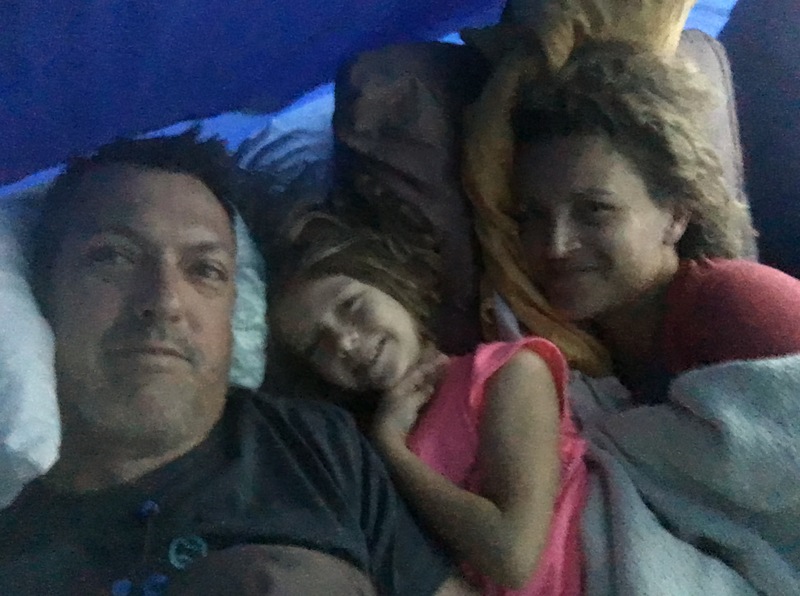 We spent four nights sleeping in a tent with two kids, in a campground with no showers. Our site had no water spigot – obviously no electricity. No cell service. It rained on the first day and everything was damp the entire time. Our mattress was wet. It was cold at night. And I didn’t want to leave. 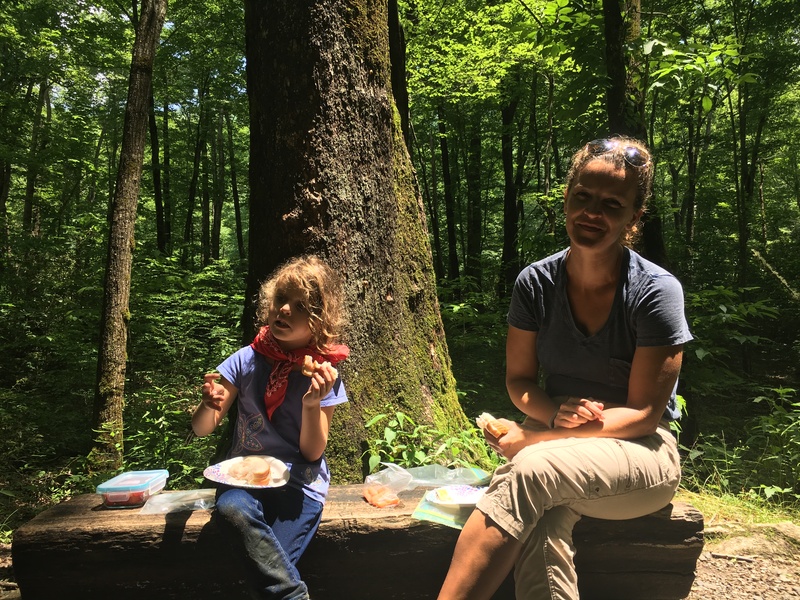 If I told you only one thing about our stay at the Elkmont Campground in Great Smoky Mountains National Park, it would be about seeing the rare synchronous fireflies that only occur once each year – and only here. So, I’ll get to that later. This picture doesn’t even do it justice. The kids had a little brook to play in, most of the time we had no neighbors (more on that later). The way the afternoon light cut through the mist and the trees was truly magical. And this is just where we camped. The park is incredible. 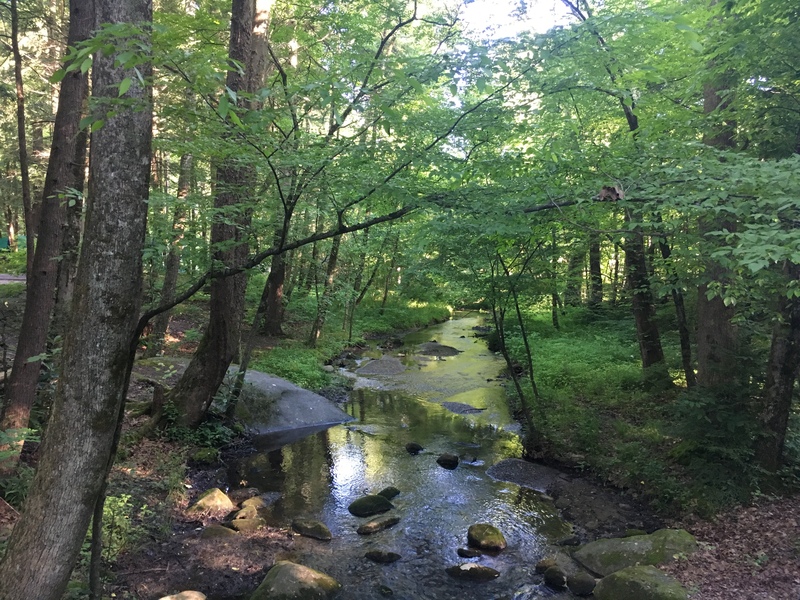 Great Smoky Mountains National Park is a seemingly endless expanse of streams, hiking trails, rocky waterfalls, and sunny meadows. We saw bears, turkeys, snakes, deer, spiders, and fireflies (more on that later). If you like to hike, come here and never look back. For me, hiking comes with a lot of caution. My vascular condition loves for me to walk, but in the same way that I’m limited from lifting more than 35 lbs, I also have to make sure I’m not straining myself (not too steep, no rock climbing). When it comes to hills, it’s about patience, keeping the heart rate low. I wear a Fit Bit style watch that tells me my heart rate. But the best device is a 5 year-old who has no desire to go fast. While Monica and our son speed up the hills, I hang back and go at the pace of a little girl. Yes, I hike like a girl. 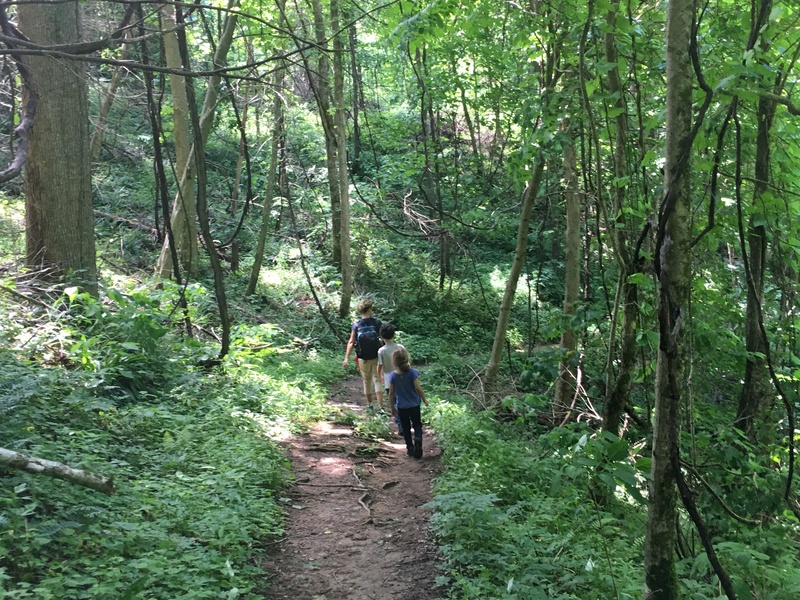 But as we meander up the trails, we appreciate the butterflies and I’m pretty sure our slow pace was why we saw a gold striped rat snake in the path. As you can see, some of the hiking trails aren’t cliffhangers. There are all types. Left: In my favorite movie, Tombstone, Kurt Russell drinks from a mug like this one that my friend gave me in college (because of that scene.) I’ve been using it for camping ever since, and for a brief moment, I’m Wyatt Earp. Right top: Getting cozy in the tent. Bottom right: No caption needed. 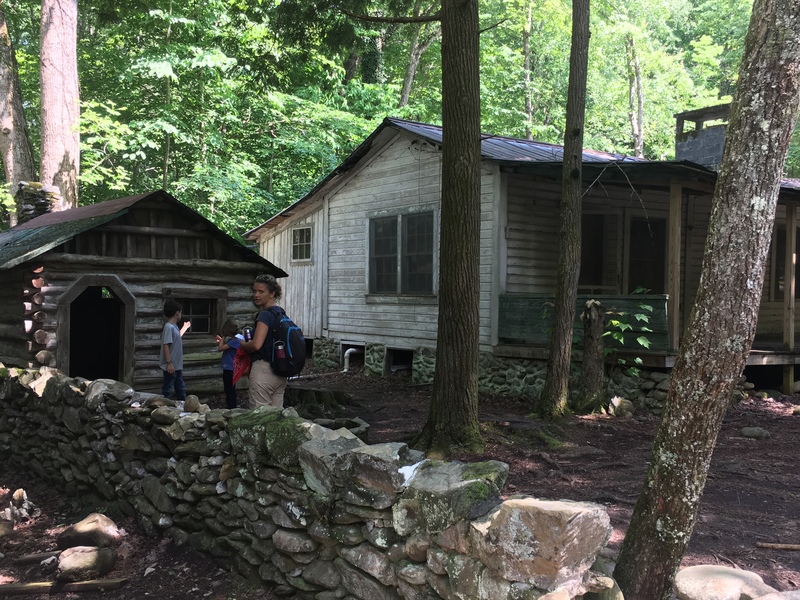 One of the unusual things about Great Smoky Mountains National Park is that it once had towns and people living within its borders (most were bought out when the park formed in the 20s and 30s, but some owners held on to summer cabins into the 1990s.) Above our campground, was a “ghost town” of these cabins, as well as the remains of many that had been removed. 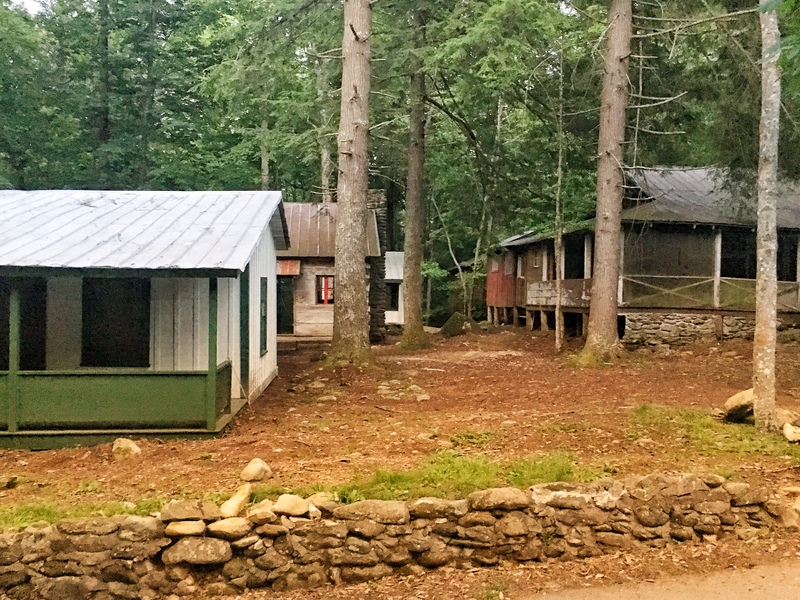 Our faith in humanity is restored a little when we found this little village – without a hint of vandalism – quietly harkening to a different era. Something that I found startling was the park’s proximity to the town of Gatlinburg. The park gates are at the edge of town, and our campground just 15 minutes up the mountain road. 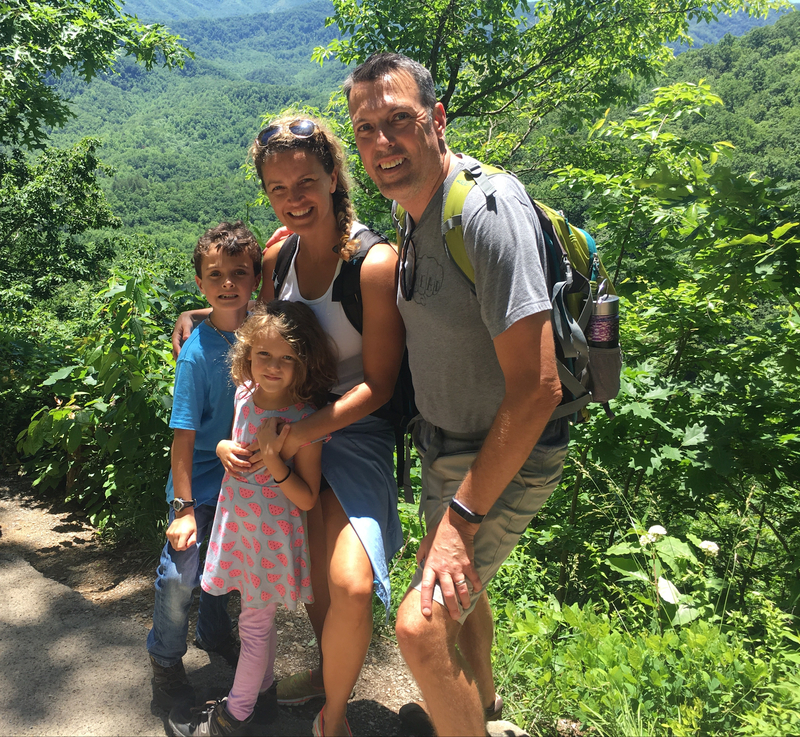 If you aren’t familiar with Gatlinburg, think of it as a hillbilly version of Atlantic City – perhaps a bit more family oriented. For us, it served as a convenient place to do some laundry while it rained, and grab a good pizza at the creatively named “Best Italian.” At its edges were the Nantahala Outdoor Center’s outstanding camping store (I really love camping stores), and ski lifts stretching into the mountains; in the middle is a sea of tourists in camouflage hats tottering past candy shops, barbecue joints, and a vintner boasting “home made” wine. Mmmm. Gatlinburg has all the conveniences we’re trying to avoid. 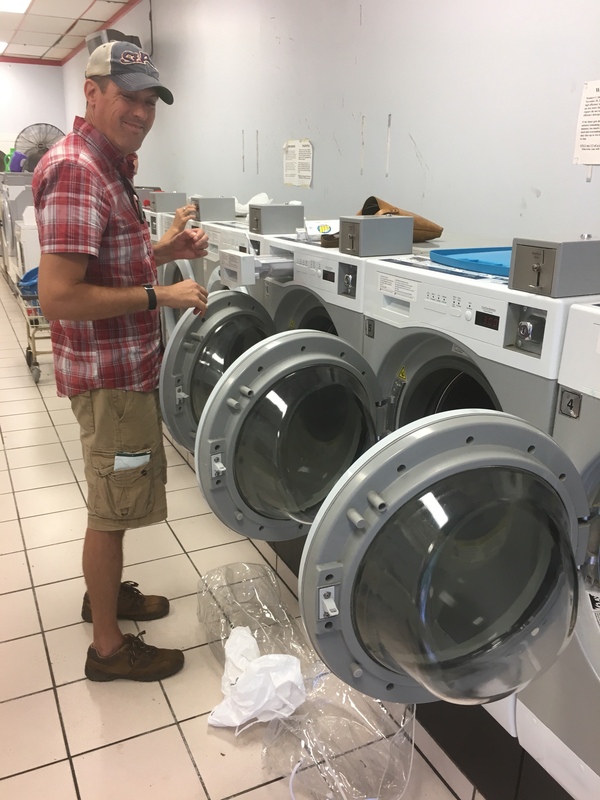 The laundromat was handy, however. When our daughter touched another patron’s basket, a woman earnestly warned us of the owner’s drug habit. She worried that our daughter might accidentally ingest drugs from this incidental contact, which made me wonder why addicts don’t just run around licking the belongings of fellow users. This campground is why I wanted to do this trip. 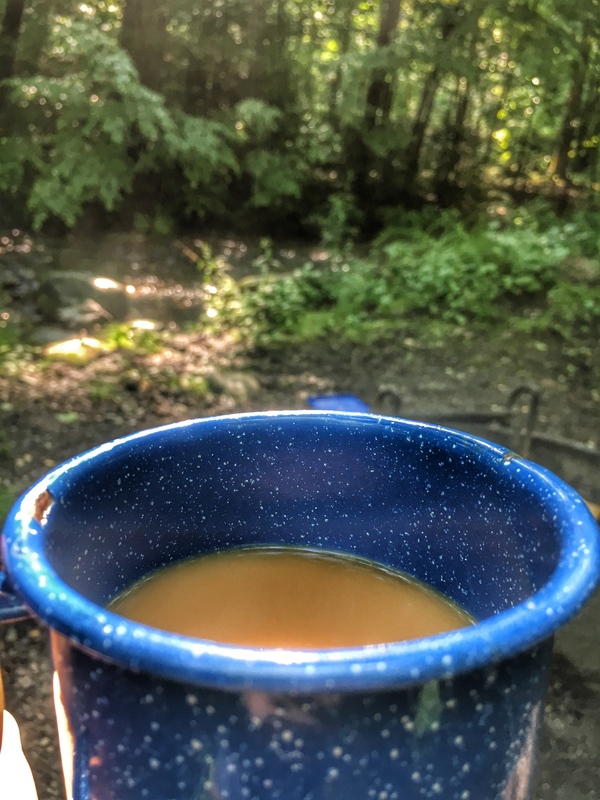 Cool air, a campfire, and a fresh pot of coffee are all I need. It’s heaven and we’ll be back. 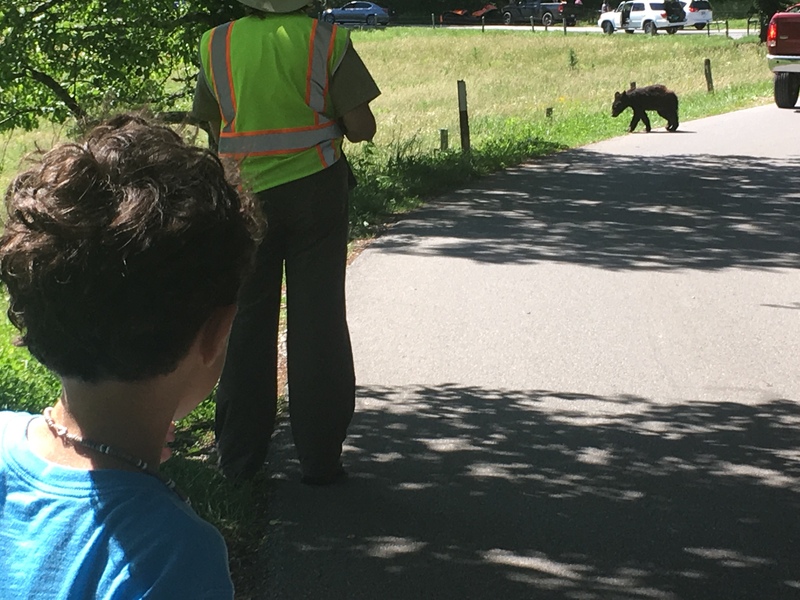 We drove a one lane loop through Cade’s Cove where were watched a family of bears cross the road into a meadow. We took a short hike to a waterfall where the kids played in the ice cold pools. I cooked in our Dutch Oven, we roasted marshmallows, Monica read a book aloud while an owl hooted outside. Did I mention it was heaven? I haven’t even told you about the fireflies. 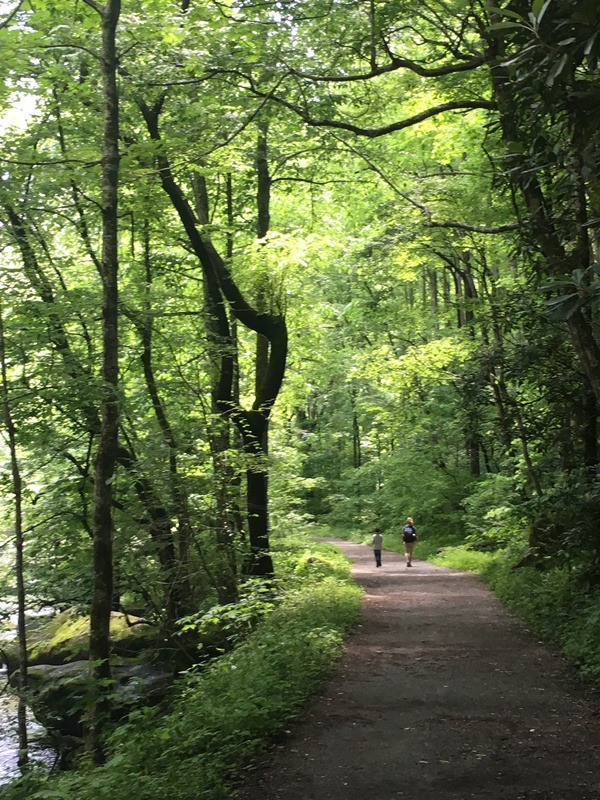 The Smokies are America’s most visited National Park, yet I never got a sense of crowds. The only “traffic jam” was caused by a family of bears crossing the road. Finding a place to wade into an icy cold stream takes no effort. I strive to keep a tidy campsite. Monica strives to keep tidy people. While I consider a “quick bath” to be splashing some water under my armpits, Monica sets up a human scrub station. I don’t believe our children get as clean in the shower at home as they do washing out of a bucket under their mother’s supervision. As I heated pots, they removed ten pounds of Tennessee from their skin. What is this? Woodstock? 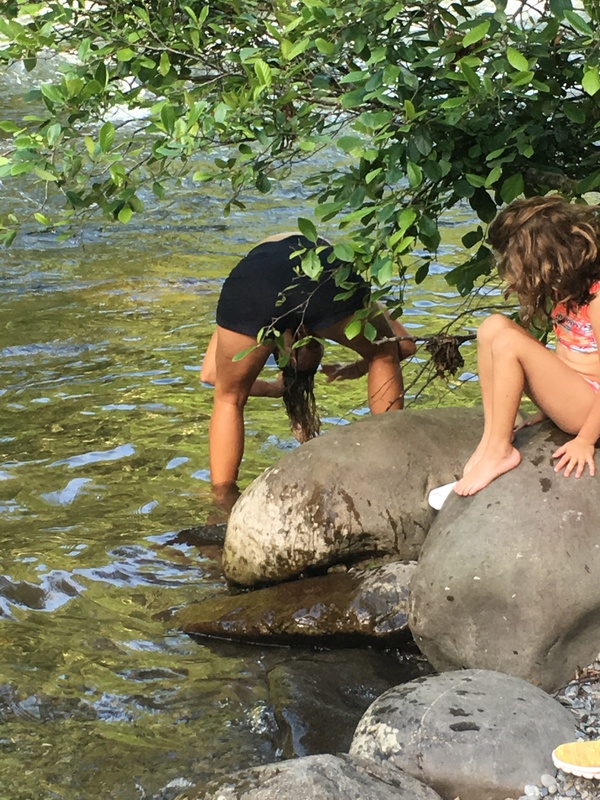 After a few days without washing her hair, she couldn’t take it anymore and decided to wash her hair in the river behind the “cover” of a rock. At least she kept it PG-13. Back in camp, it was a peep show for the neighbors. By the end of the summer she’s going to be living with a pack of wolves. Alas, Monica’s bathing ritual was not the most beautiful thing to light up the night, for we were lucky (unintentionally) to be there during the annual mating ritual of a rare species of firefly. These fireflies join in synchronous flashing in large groups by the thousands. I know that you’re imagining a bunch of lightning bugs flashing together like Christmas lights, and that’s a decent way to describe it. The truth is, there’s no way to describe it that tells of the surprisingly simple beauty of a dark mountain forest suddenly alive with light. It’s poetic, spiritual, and other-worldly. Without saying anything specific about “god” or “religions” of man, it’s the closest thing I’ve seen to proof of a benevolent creator in the universe. The park has taken to regulating the number of visitors who take in the spectacle through a lottery. We were lucky that they started their mating early, and we had a campsite in the area. Other viewers booked camp sites to guarantee parking, but packed up and went home after seeing the lights, leaving us with no neighbors, and our own football-field sized piece of the forest floor to ourselves. The scenic loop around Cade’s Cove is a must-see. On Wednesday thru Saturday mornings they close to road to cars, so that cyclists and runners don’t have to compete for road space. Monica regrets not carving out some time to run this loop. Plan your camping around storing food and scented toiletries away from bears. The campgrounds have a few public “bear boxes” but it’s not the most convenient, so your car is the best bear box. The tent sites have a “pad,” which is great for preservation of the site, but also a bit limiting in how you set up. 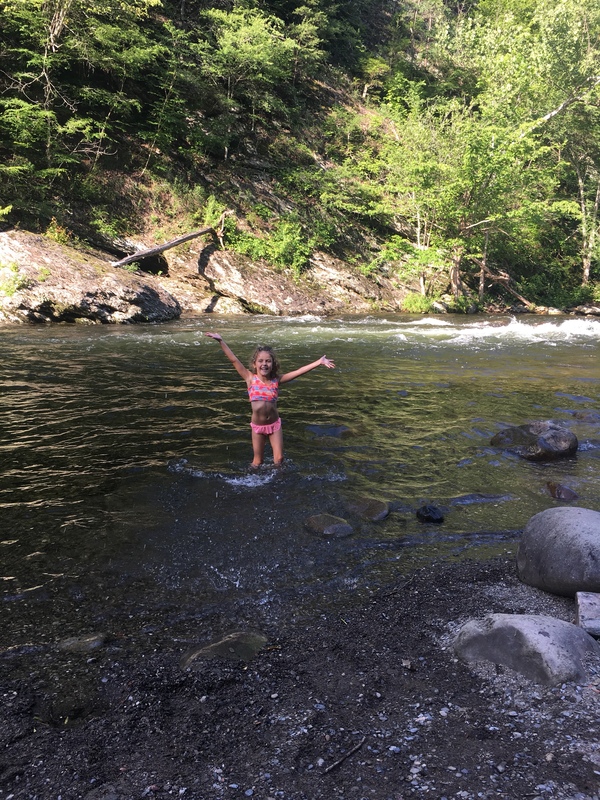 And they pool rain water – we learned this the hard way by swamping our daughter’s sneakers. Don’t bring your own firewood. To keep out invasive insects, you’re only allowed to use theirs. The camp concession stores sell ice, wood and a lot of other necessities for remarkably reasonable prices. You’ll never see it all. We caught just a sliver and we’ll be back. Did the old Jon Kile ever think he’s be content watching fireflies mate? Sounds like you and Monica make a good decision taking this fun adventure. 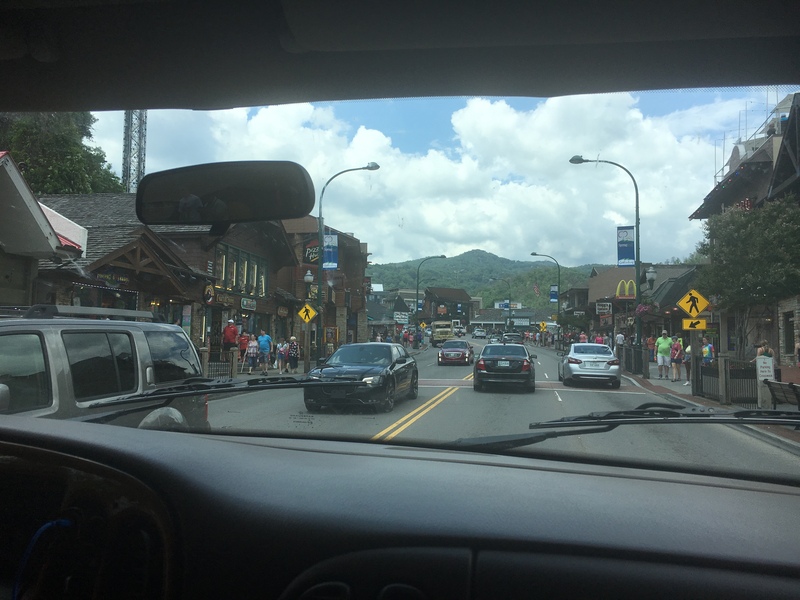 Pingback: Asheville to Nashville to Oklahomashville – Don't make me turn this van around! Pingback: Yellowstone – Don't make me turn this van around! Pingback: Homeward bound! – Don't make me turn this van around!